Elegant, charming, diverse, walkable, leafy are some of the adjectives used to best describe Old Palo Alto, one of the town’s most sough-after neighborhoods. 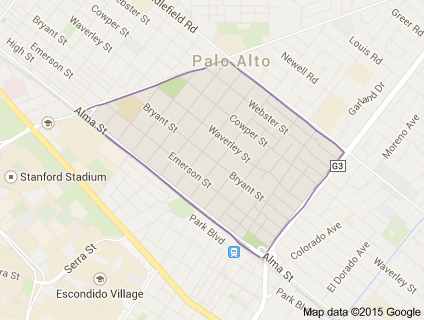 Old Palo Alto is also well-known for its famous affluent residents: it once was home to Steve Jobs, former CEO of Apple, Larry Page, co-founder of Google, or Steve Youngs, former San Francisco 49ers quarterback. Here the residents enjoy bigger lots than in other neighborhoods, with an average of 9,000 square feet, making way for the construction of luxury homes, though the neighborhood’s architectural sizes and styles remains very diverse, ranging from Tudor to Eichler, Craftsman or Mediterranean. The first house of the neighborhood was built south of Embarcadero Road in 1902 by the descendants of Proctor and Gamble co-founders. Their daughter, Elizabeth Gamble, later gifted the estate to the city of Palo Alto. In 1985, the City Council decided to lease the estate, and thus the Elizabeth F. Gamble Garden was born, giving residents access to 2.5 acres of plants and trees. Residents can also often be seen at the nearby Palo Alto Lawn Bowls Club’s free Sunday classes and tournaments throughout the year. Neighboring children attend the highly-rated Walter Hays or Addison elementary schools. Close to Stanford University, the neighborhood also provides easy access to Highway 101 for commuters, and both Palo Alto and California Ave Caltrain Stations are just a short walk away. - Addison Kids' Club, 650 Addison Ave.
- Neighborhood Infant-Toddler Center, 311 N. California Ave.
- Cambridge, 265 Cambridge Ave.
- Castilleja School, 1310 Bryant St.